The tuk-tuk (à¸•à¸¸à¹Šà¸à¸•à¸¸à¹Šà¸ or à¸•à¸¸à¹Šà¸à¹† in Thai) is the Southeast Asian version of a vehicle known elsewhere as an auto rickshaw or cabin cycle. 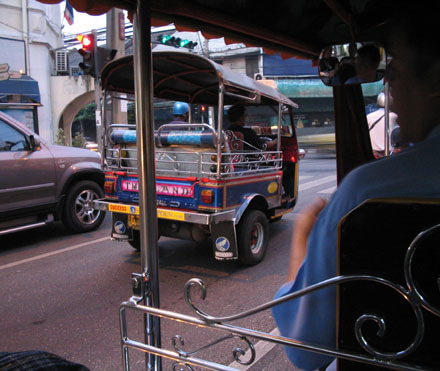 It is a widely used form of urban transport in Bangkok and other Thai cities, as well as other major Southeast Asian and South Asian cities. How I define it is: Three-wheeled, hoverboard-like hellion of the traffic-choked fleshpot! But yeah, it’s kinda like a motorized rickshaw too. The driver sits in front and one or two farang adults or three somewhat skinnier Thai adults, or up to (we-swear-to-Cthulu-saw-this-today) five schoolkids sit in back. The tiny gas-powered motor putters to life and pulls the whole contraption into traffic. It is, as you might guess, awesome. Let’s go on a tuk-tuk ride together, shall we? First there is the measured buildup, sidling along just faster than the various pedestrians. The other tuk-tuks swarm about us, waving and smiling. Notice how the metal filigree between driver and passngers looks exactly like a bedframe? That’s just one part of what gives the experience its Hey-I-just-put-a-motor-on-my-couch-want-to-go-for-a-ride? feel. But look! A tuk-tuk-size opening in the traffic . . . The sudden acceleration (or “dash of death”) between other, much larger vehicles begins! Any of them could crush us without a second thought! It’s like riding a poodle into a stampede of t-rexes! But then a stretch of open road is spotted . 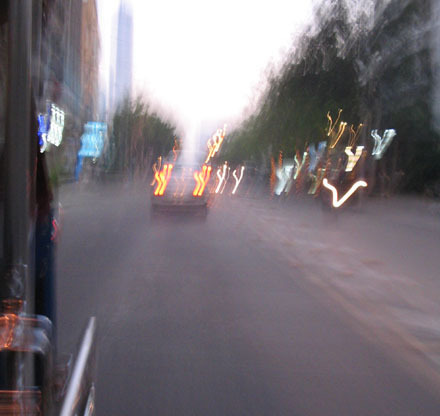 . . and we make the jump to tuk-tuk hyperspace! The dizzying crescendo! Your teeth are rattling like a pearl necklace in a blender! And then, suddenly, the screech of brakes and blinding glare of brake-lights! Ahhh, we are at our destination. And, um, why are the brake lights inside the passenger cabin? That’s just odd. Goodbye, little tuk-tuk! We shall meet again, like the next time I need a medium-length ride in motorized transport and don’t have luggage. Update: Here’s what we did today, as recounted by Justine. Love the name. Tuk-Tuk! It makes me think of the lovely characters of Oz. I had no idea that auto rickshaws existed. Hm. Our Nova Scotian dwarf land-manatee really likes the tuktuks, although he doesn’t want to ride in one, because he thinks it would make him smell bad. 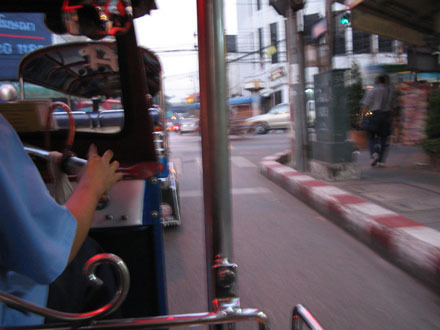 Watch out for the tuk tuk driver who takes over your life. You know, “oh, would you like some shirts? Some silk?” Or maybe they’re not doing that so much anymore? I want to ride in one, it will now be my dream and goal in life. I swear, it will be. There’s a great chase scene involving these in Ong-Bak: the Thai Warrior. Oh yeah scott have you seen the Mythbusters episode where they try and build a hoverboard??? Very entertaining, I watched it in New York this weekend. So, Scott, any possibility of you coming to Philly to do a signing/talk/general appearance to the loving masses? 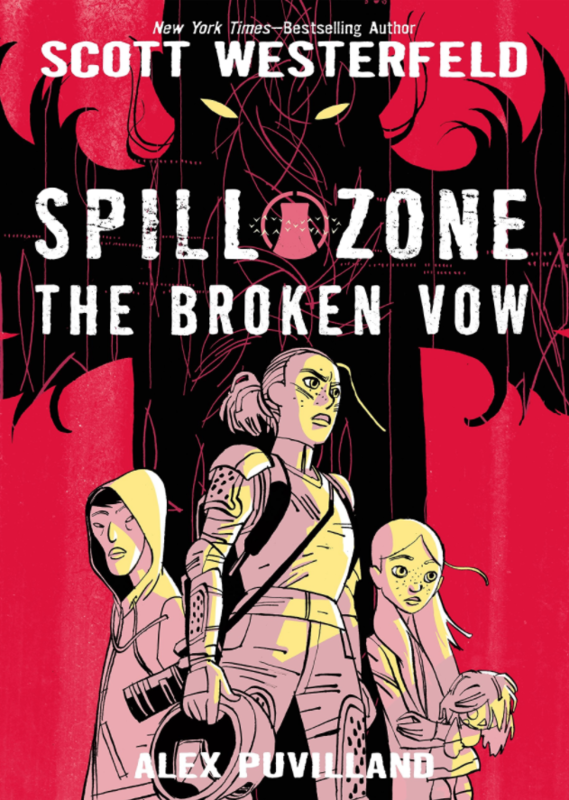 Specials just got in at our school library and there’s a 15 person waiting list already…. i need one of those!!!!! your enthusiasm is really showing through, scott, you should be like oprah and buy everyone a tuk-tuk! Neat! I want one! Maybe I can talk my parents out of the minivan we own…..hmmm.. Lol! the whole bed thing makes me think of chitte chitte bang bang… so i have to ask, how were the fish under the sea? those look purtty darn cool! LUCKY! i am going to Thailand this summer for a missions trip. You are very lucky to be able to see all that cool culture stuff. those car-things look fun too. i wish i had one…. those are so cute! im thinking first car material…. btw, loving your books. ha. i typed in boos. ha. thanx for the writing its….awesome. Fun! I want one (as my first car, that is)!!! Topaz, why did you sign it Amber? Imposter, stay away from our tuk-tuks! 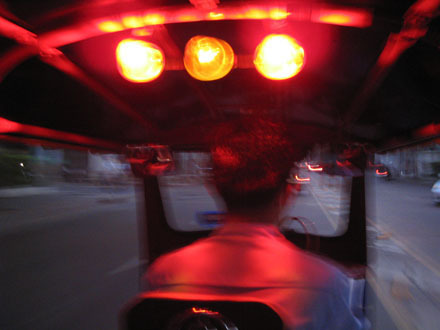 Tuk-Tuk’s are amazing, they’ve got them imported down to Guatemala, they’re yellow and red there though, as far as I know… They’re super fast and not for the elderly, that is for sure. And they’re supposed to fit only 4 people, including the driver… Yeah…. It can really fit 7, if you’re suicidal. Which apparently I was down in Guatemala, because I did that. However, I did not die, and I also rode in a bus, with my knees curled up to my chin. Backwards. And the only seats were wooden kid’s seats… it was interesting. Better than powered skateboards lol? I didn’t see it in operation, but there is one of these in front of a Thai Restaurant in Jackson Hole, Wyoming. I had been content to play rickshaw jam online until I decided I wanted one then off I was googling motorized ricksahws. I found your blog. I enjoyed your entry tuk-tuk! and having gone between your blog and website I have lost all track of time. Never read your books, I am intrigued and will seek post haste. I wonder if I can buy a tuk-tuk on ebay. 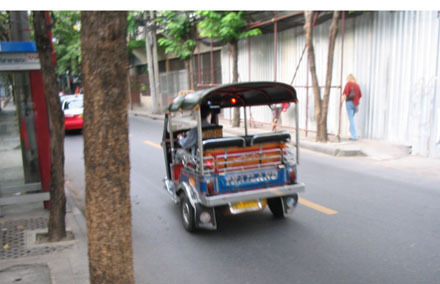 Hey people if it’s a Tuk Tuk you need then email me with speed. 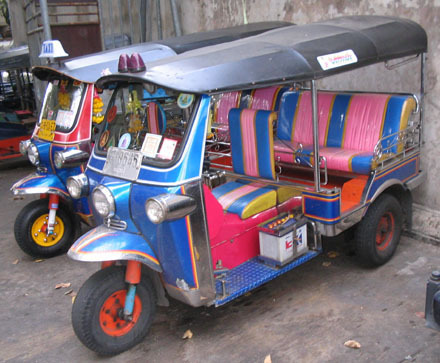 We have Tuk Tuks for sale and street legal in the US, need I say more. tuk tuk tuk tuk tuk! 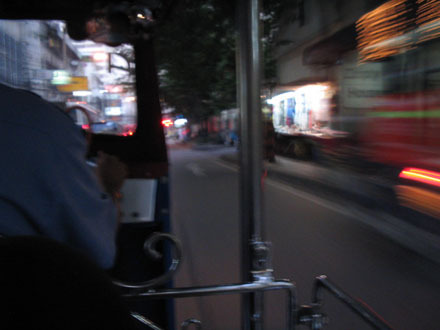 And then, when I got my tuk tuk all new and sparkly and shiney and reeking of new tuk-tuk smell, I would zoom about the suburbian streets of Illinois, drive my friends to school, take last minute road trips to anywhere I wanted to. Me and my tuk tuk. I would feed it and love it and care for it and call it George. If I had a drivers liscence. And if I wasn’t two years to young, I would go and get a drivers liscence, and then sell all my non-vital organs so I would have enough money for tuk-tuk. I swear to Cthulu, God, and Spongebob that I would. Steve, Well? When the hell you going to publish that Web-Page, it still says your building it. Lots of people are interested and you have the great web-site name…but where and when are you? My husband wanted me to go on one of those death traps in India and I consider a complete victory that I managed to stay off them. Yo people- the tuk tuk is here. In USA. Yes seeking EPA approval now, DOT is done. Can I post the USA website as to where and how to get them, let me know. They are the MOST EXCITING RIDE EVER !!!! !